Slice of Life isn’t the most popular genre compared to fan service type genres in anime. However, you shouldn’t overlook this genre. 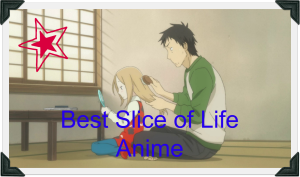 I personally have enjoyed my fair share of Slice of Life anime and would love to share with you my top 10 all time favorites here. This anime is about parenthood and the trials and tribulations of raising a child. But, who wants to watch parenthood when you can watch brainless muscular heroes and fan service anime? Well, this anime is unique and really portrays a sudden surprise in life. The main characters gets to raise a child out of nowhere and his life suddenly gets complicated. I guess we can all relate to this as we usually have unexpected incidents where things doesn’t always go according to what we think. This is the female version of parenthood when compared to Usagi Drop. It also incorporates a bit of fantasy as in the characters are “wolves”. The story can be clearly defined in 3 stages. The first is Hana(main character) falling in love. The second is her struggles to attend to the needs of her 2 special children. The third her relationship with her children and watching the growth of her children. There is also plenty of struggles to make ends meet, which I think many people can relate to that. Calling this anime “werewolves” would not be fitting as it truly shows the spirit of maternal love. Barakamon is a perfect anime for traveling fans. 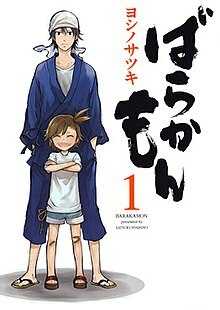 Barakamon captures the joy of children and what it can bring to adults. 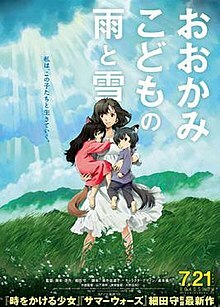 It is about Handa Seishuu, a 23-year-old calligrapher prone to anger and misfortune, and his friendship with the villagers who keeps screwing with him through some funny incidents. As the story progresses, you get to see him embrace whatever comes to him and it is a surprisingly mature anime despite Handa being quite childish. We would all love to be a kid again isn’t it? 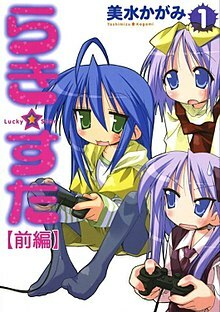 Now Lucky Star is the story of the daily lives of 4 girls. Most of it involves school and daily stuff like doing homework, watching anime and playing video games. I think I can relate to Konata the most, as she really is a carbon copy of my younger self. Loves to play and have bad grades in school. When it comes to last minute studying, she is the Queen and I am the King. I would think that most of you can relate to last minute cramming of studying for exams right? The story line might be lacking but I still think overall it is a good anime to watch. K-On! 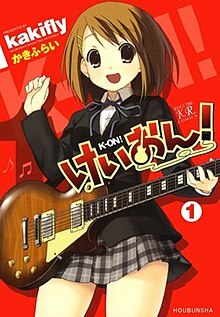 portrays the story of a music inept girl named Hirasawa. She starts off not knowing anything about musical instruments but as the story progresses, she becomes better and better. She also learns how to balance school work while working hard to become the best guitarist in her band. Being someone that has no musical talent, it is refreshing for me to see her grow and gradually become a rock star. The struggles she deals with is something I can totally relate to.